Cambridgeshire’s County Cup competition the Invitation Cup reaching the quarter final stage this Sunday, 8 sides vying for a place in the semi-finals, through without kicking a ball are ERWFL Division One side, St Ives Town Ladies awarded a home with after opponents ICA Sports Ladies withdrew. That left 3 quarter final ties to be settled on the pitch. It was an all Championship tie with Championship North side, Wisbech Town Ladies hosting Championship South side, Park Ladies for the 2nd successive Sunday. A 2nd successive win for Wisbech Town Ladies too as they reached the last 4 of the Invitation Cup courtesy of a 7-1 win. 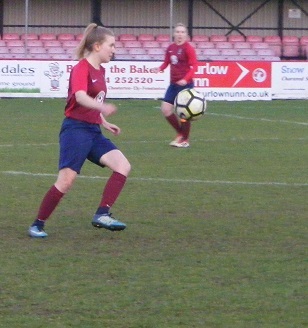 Both Amy Newell and Jasmine Luckett scoring two each, Luckett’s first goals for Wisbech Town, also scoring were Chloe Stanborough, Leah Hall and Sophie Swinden. 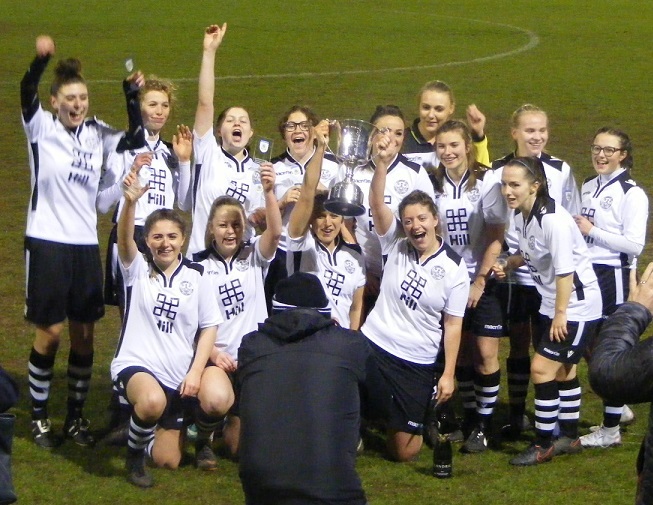 Cambridge City Ladies are the new holders of the Cambridgeshire Women’s Invitation Cup they began their defence of the trophy in the quarter finals drawn away from home against ERWFL Division One side, Histon Ladies. A 100% record at the top of the ERWFL Premier Division, Cambridge City Ladies kept up their winning form winning the game 3-0 to reach the last 4 of the competition. Charlotte Gillies, Sarah Mosley and Erin Davies getting the goals. FAWNL South East Division One side, Cambridge United WFC were drawn away in the quarter finals of the Invitation Cup up against Newmarket Town Ladies, showing good form following promotion to ERWFL Division One this season. Newmarket holding thier higher league opponents for much of the 1st half, Cambridge United breaking from a Newmarket corner in the 44th minute, Jade Bell there to turn the ball into the back of the net as Mollie Coupar’s shot came back off the post. 1-0 the half-time lead it was Coupar herself who doubled the visitors lead her presence in the box bringing a defensive error for which she pounced on the ball and shot home. Bell put through on goal late in the match to score her 2nd of the game and send Cambridge United through to the last 4. The Cambridgeshire Women’s Junior Invitation Cup also beginning this Sunday, 2 tie scheduled in the 1st Round, Cambridge City Ladies Development going through courtesy of a home win over Riverside Ladies, that left just the one tie to be played. March Town Ladies from the Cambridgeshire Women’s Premiership hosting Championship North side, Wisbech St Mary Ladies. A comfortable first half for March saw them holding a 3-0 lead at half-time, doubled that scoreline 2nd half to progress with a 6-1 victory. 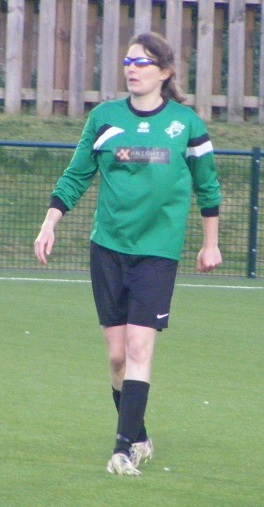 Their goals coming from 6 different players with, Louise Barbour, Adele Munday, Emma Searle, Megan Webb, Georgia Brown and Claire Watts. Carlie Knight with the 2nd half goal for Wisbech St Mary. 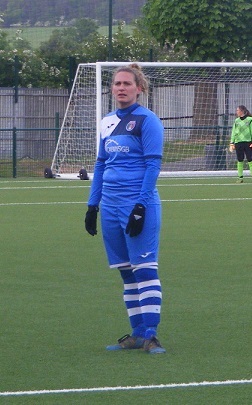 One game played this Sunday in the group stage of the Cambridgeshire Women’s League Cup. In Group D, Cambridgeshire Women’s Premiership side, Cambridge University Women were hosting Burwell Tigers Ladies from the Championship South. Having suffered defeat away to Fulbourn Institute Bluebirds in their opening group match, Cambridge University got their 1st win this time around with goals from Amanda Wainwright and Lili Donlon Mansbridge plus a brace from Shona Lester securing a 4-0 win. One league match played in Cambridgeshire at the weekend on Sunday morning in the Championship South, 3rd placed, Cambridge Rangers Women hosting 2nd placed St Ives Town Ladies Development, a one sided contest with St Ives rampant in front of goal achieving a double figure scoreline to win the 3 points and move level on points with Haverhill Rovers Ladies at the top of the table. Frances Chapman scoring 4 goals, Megan Stow claiming a hat-trick, a goal to for Connie Hornibrook along with a brace for Jade Carpenter in a 10-0 win for St Ives. This entry was posted in Cambridgeshire Women's Championship South, Cambridgeshire Women's Invitation Cup, Cambridgeshire Women's Junior Invitation Cup, Cambridgeshire Women's League Cup, The Round-Up and tagged Cambridgeshire Women's Championship South, Cambridgeshire Women's Invitation Cup, Cambridgeshire Women's Junior Invitation Cup, Cambridgeshire Women's League Cup, The Round-Up on November 21, 2018 by WFEast. One more women’s final left to be played in Cambridgeshire a trip to Newmarket Town FC’s, Bloorie.com Stadium this evening for the Junior Invitation Cup Final between Isleham United Ladies and ICA Sports Ladies. Cambridgeshire Women’s Premiership side, ICA Sports Ladies aiming for a Cup Double after winning the League Cup two weeks ago. 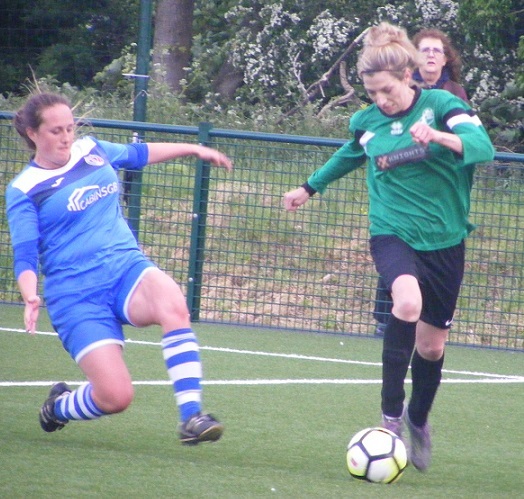 Up against fellow Premiership side Newmarket Town Ladies, ICA Sports Ladies were the underdogs, putting in a strong performance as their opponents never got into their stride. This time around taking on lower league opposition in the Junior Invitation Cup, ICA Sports Ladies are themselves the favourites but will be only to aware that doesn’t count for anything if you don’t perform in the game. A Cup Double though the perfect way to end their season. A Cup Final appearance and a shot at winning silverware too for Cambridgeshire Women’s Championship South side Isleham United Ladies. Know themselves they face a tough test in this evenings final but have earned the right to be there. League form hasn’t been good this season have saved the best for their cup run to this evenings final. Close to Newmarket the club has brought plenty of support along to the final. Peterborough based ICA Sports Ladies receiving a bye in the 1st Round of the Junior Invitation Cup. Isleham United Ladies were drawn at home to fellow Championship South side, Burwell Tigers. Amy Ellis and Lily Turner both scoring twice with Annabelle Marsh and Livi Caffarelli getting a goal a piece in a 6-1 win. Onto the quarter finals Isleham United Ladies were once again at home taking on another Championship South opponent Cambridge Rangers. Louisa Harwood, Nicole Bailey an a brace for Vicky Beeton putting Isleham through to the last 4 of the competition. ICA Sports at home in the quarter finals up against Histon Ladies Reserves who they had knocked out of the League Cup via a penalty shootout. That wasn’t needed this time around a brace for Carmen Herridge putting them through the last 4. The semi-finals saw to close games played. Isleham United Ladies again on home soil up against Newmarket Town Ladies Reserves also from the Championship South, A brace for Lily Turner along with a goal for Rachael Turner seeing Isleham edge the result 3-2 to reach the final. ICA Sports Ladies were drawn away to fellow Premiership side Cambridge City Ladies Development. Just the one goal scored in the match ICA Sports clinching a place in a 2nd final, Jessica Farchica with the all important goal. The game originally scheduled for last month postponed due to heavy rain. The weather better this time but the heat has vanished a chilly breeze making it feel very cold, cloud cover above. The venue for this evenings final Newmarket Town FC. Playing on their new state of the art cork based 3G pitch. The bar and kitchen open a goo sized crowd gathered to watch the game. Isleham United Ladies starting XI – Claire Knibbs, Holly Partner, Sophie Antonucci, Becky Shields (C), Sarah Rouse, Zoe Luddy, Jessica Farchica, Megan Purnell, Donna Nicholls, Rhian Leonard & Lorna Hart. Subs – Carmen Herridge, Lindsey Short & Cara Clarke. ICA Sports Ladies starting XI – Kathleen Tilbrook, Kate Theobald, Olivia Menton, Livi Caffarelli, Donna Woodcock (C), Vicky Beeton, Annabelle Marsh, Lily Turner, Louise Harwood, Amy Ellis & Laura Todd. Subs – Jade Flack, Anita Butters, Rachael Turner, Shona Kelly & Nicole Bailey. ICA Sports put pressure on the ball prevent Isleham getting out of their half win a throw high on the left the ball worked in towards the top of the area, Livi Caffarelli defending for Isleham. Breaking up an ICA Sports attack Isleham bring the ball away on the left, Lily Turner carrying it forwards plays the pass inside to Vicky Beeton as she crosses over halfway, the midfielder sending the pass on out to the left with Amy Ellis providing the run taking the ball down to the byline sends a cross flashing in along the face of the ICA Sports goal, Laura Todd closing in on the far post isn’t too far away from connecting with the ball. Isleham bringing the ball on again right side this time the ball sent in towards Todd making a run into the area near side, Becky Shields, ICA Sports captain going with her heading the ball putting it away to the right Isleham retrieving the cross swept in goalkeeper Claire Knibbs claiming the ball. ICA Sports break through the centre the ball pushed on through to attacker Lorna Hart in behind strikes the ball from 25 yards out pulls her effort wide of the post. Following a corner on the left ICA Sports have bodies forwards as they squeeze possession back from Isleham Jessica Farchica closing in on the top of the area seeing her shot charged down goes after the rebound out to the right getting hold of the ball holding off a challenge turned well to get inside attack the goal near post, goalkeeper Kathleen Tilbrook making a great save at her near post, the ball scrambled behind for a corner kick. Caffarelli with another good defensive challenge to deny Zoe Luddy for ICA Sports as she breaks beyond the midfield played in by Hart central. GOAL! ICA Sports score the opening goal of the game taking an early lead as they did in the League Cup Final. The ball played on down the left Nicholls with Megan Purnell getting on her pass slide on into the box Hart timing her run perfectly getting onto the ball and picking her spot left of goal sends the ball past the keeper into the back of the net 0-1. ICA Sports look to build on their lead Hart going towards the ball played out to the right holding it up well outside the Isleham area before shifting it inside to fire a cross along the six yard box, two ICA Sports players at the far post Purnell one of then, controls and spins into a shot, the ball charged down. Isleham get the ball clear, ICA Sports regain central and turn play around, Farchica moving with the ball towards the top of the area is stopped by Caffarelli. Isleham make a double change Olivia Menton and Kate Theobald off on come Anita Butters and Rachael Turner. Caffarelli with a fantastic tackle on Hart to stop the attacker as she looks to force her way past her into the box. Todd comes off for Isleham, Nicole Bailey coming on. Annabelle Marsh breaks forwards for Isleham as they build through the middle the ball out to her on the left side, Holly Partner getting back on her to tackle for ICA Sports. Lily Turner getting up to support Marsh latching onto the ball delivering a cross into the area the ball claimed by Knibbs. Caffarelli winning the ball at the back for Isleham is fouled as she tries to carry it out from the back. Hart moves away into the right channel as Luddy plays the pass from the middle out to her the attacker turning her marker as she enters the box and making a driving run towards the near post tries to lift a shot over the keeper with the outside of her boot, Tilbrook holding onto the ball for Isleham. Rhian Leonard moving over to the left for ICA Sports looks to have gotten clear in behind as a clearance rebounds off her from Caffarelli, the defender showing great pace however recovers well getting back on her inside the box sliding in to take the ball away for a corner. Her knees taking a bit of a battering upon the artificial surface Caffarelli comes off after treatment on the pitch, Menton coming back on going to left back as Ellis drops back into the defence. Ellis called into action straight away defending well up against Hart as the ball is fired low into her from the left. Carmen Herridge has come on to join the attack for ICA Sports Ladies replacing Purnell. Herridge attacking the ball top of the area left channel, Ellis closing the ball down for Isleham. Purnell isn’t of for long as she replaces Leonard for ICA Sports. Isleham captain Donna Woodcock defending up against Hart inside the box as Herridge moving to the right sends the cross back into the area. The corner conceded the ball put into the mix from the right is clear by Isleham falling to Purnell positioned inside the D her 1st time strike is well wide of the mark. Sarah Rouse defending for ICA Sports as Isleham’s Bailey looks to get in behind through the middle. Caffarelli back on for Isleham straight away wins the ball back form Hart as she looks to find a crossing position on the left. Isleham launching a counter attack Lily Turner showing a good turn of pace bringing the ball on up the left wing covering alot of ground the ball squared across the face of the ICA Sports area, Ellis pressing the defender on the ball steals possession and turning into the box fires a shot in towards goal, Knibbs getting down makes a great save. Woodcock with a fine recovering tackle as Purnell latches onto a poor kick out from the back looking to get herself into the box. GOAL! The half -time whistle approaching ICA Sports extend their lead attacking down the left the ball cut inside brought into the area and stabbed in near post Herridge on the end of the cross spinning into the shot and sending the ball past the keeper and over the line 0-2. 2-0 the half-time lead for ICA Sports Ladies have dominated play without really getting into their stride. Largely down to the fact Isleham have pressed the ball really well, winning several vital challenges at the back preventing ICA Sports getting one on one with the keeper. Have attacked themselves with limited success but after conceding an early goal haven’t let the game get away from them, ICA Sports managing to double their lead on the stroke of half-time. Onto the 2nd half both sides making a goalkeeper change at the beginning of both playing an outfield player in the position. Knibbs is replaced by Hart, Tilbrook replaced by Bailey. The floodlights on for the 2nd half it’s Isleham to get thing’s underway. ICA Sports put pressure on the ball straight away getting it on win a corner on the right. Isleham get the ball forwards Shona Kelly and Todd also on for Isleham the ball out to the left for Lily Turner runs with the ball before sending a cross into the area, Hart taking the ball into her body at the near post. Lily Turner fed the ball on the left takes it on once again sweeping a cross into the area Rouse defends for ICA Sports with Rachael Turner closing in from the right flank. An encouraging start to the 2nd half for Isleham Beeton taking a shot at the ICA Sports goal from distance the strike wide. Pressing the ball well all over the pitch. Antonucci defending for ICA Sports at left back as she gets in between Rachael Turner and Beeton as they look to link up attacking down the right. Beeton getting forwards into the area as Isleham get bodies forwards ends up fouling Rouse as she gets control of the ball. Rouse with a good piece of defending at the top of her area as Lily Turner attacking down the left sends the ball in across the area, Todd looking to try and bring it down, Rachael Turner closing in the ICA Sports central defender winning the ball. Up the other end Isleham need to be wary of getting hit on the break Farchica on for Herridge, she tries to muscle he way through into the box Caffarelli defending for Isleham. Lily Turner with the ball attacking for Isleham left side cuts inside 30 yards out Kelly in support takes on the shot the ball gathered by the keeper. Claire Knibbs joining the action up top for ICA Sports. Knibbs with a run into the right channel fed the ball from the wing, shifts the ball well between her feet inside the D before sending a shot skipping off the surface in towards goal Bailey making a good reactive save with her feet. Farchica winning the ball in the middle slides it on for Knibbs looking to attack the Isleham box, Ellis with a good tackle conceding the corner. ICA Sports having started the 2nd half slowly are starting to build momentum winning a corner on the right the ball swung in near post attacked by Shields knocked on into the middle claimed by Bailey. Nicholls on the left for ICA Sports Antonucci getting up with her to support, Knibbs taking the ball on to the byline cutting a cross back in along the face of goal, Bailey able to gather for Isleham. Knibbs caught in an offside position a couple of occasions. Kelly cutting the ball out in the middle for Isleham sets up an attack Rachael Turner away on the right taking the ball to the edge of the box looking for Todd making a run near post gets her foot around the ball sends it wide into the side netting. Rachael Turner getting help from Beeton on the right wins her side a corner kick, a great delivery in towards the top of the six yard box near post Kelly there unmarked gets her head on the ball sends it up over the crossbar. Rouse intercepting at the back for ICA Sports brings the ball on before playing it out to Nicholls on the left, support from Knibbs, Woodcock defending for Isleham. Nicholls with the ball left side comes on a one two with Knibbs the final ball played into the area too heavy for Nicholls to run onto. Shields getting back well to push the ball into her keeper as Todd makes a strong central run for Isleham as the ball is rolled into her path. Changes for Isleham Butters back on Jade Flack also on for Todd up front. Nicholls dropping her shoulder looks to take the ball inside from the left, Caffarelli closing her down for Isleham regaining possession. Bailey makes the save as Farchica gets herself forwards and into space for ICA Sports in attack top of the area looks to open her body curl the shot around the keeper, Bailey getting her gloves onto the ball. 15 minute left ICA Sports having to work to keep their 2 goal lead are starting to find spaces appearing at the back, Knibbs with some clever runs to draw players out. A free-kick right on the edge of the area for ICA Sports, Purnell rushing up to take it, gets her strike up and over the wall but Bailey is there in the right place to catch the ball. Rouse with the defensive header as Isleham send the ball long through the middle. Rachael Turner in behind on the right a low cross in along six yard box Hart scooping the ball up for ICA Sports. GOAL! Isleham have down well 2nd half finally though their defence is breached for a 3rd time as ICA Sports make the scoreline more comfortable in the final 5 minutes of the game, Rouse getting forwards playing the ball on for Knibbs right side taking in towards the corner of the area fires a low shot across the keeper and into the bottom corner 0-3. Isleham press the ball through the middle Harwood getting it on for Flack trying to force her way into the area, challenging the defender, the ball is squeezed through Harwood latching onto it sending her shot over the bar. Antonucci backed up by Rouse regains the ball inside the area as Beeton attacks it down the right. A late free-kick for ICA Sports halfway inside the Isleham half Purnell to flight the ball on into the area, attacked near post Bailey does well a corner conceded the ball landing on the roof of he net. The final whistle goes and ICA Sports win the final 3-0 and end their season with double cup success. An entertaining 2nd half to the game. Isleham United Ladies giving a good account of themselves attacked well 2nd half and for a spell looking the more likely to score. ICA Sports having to work for the win in the end. Took their chances well in the 1st half going 2-0 ahead a 3rd goal coming late on to make thing’s comfortable. An enjoyable final if very chilly. Picking this evenings Women’s Football East – Player of the Match it’s a close run thing between 2 players one for either side and both wearing the number 6 shirt. Have to pick one however those are the rules. Livi Caffarelli with some great defensive work at the back for Isleham United Ladies, contested every ball and make more than one tackle inside her box to prevent a shot being taken. Sarah Rouse takes the award up the other end for ICA Sports. Making some vital challenges winning headers. Composed as Isleham gained some confidence in attack in the 2nd period. Congratulations to ICA Sports on winning this evening’s Cambridgeshire Women’s Junior Invitation Cup Final and completing a Cup Double. My thanks to both sides for there help with the teams and describing the 3rd goal to as I completely missed it. Happens sometimes. Think that’s my finals over for the season but temptation might get the better of me. 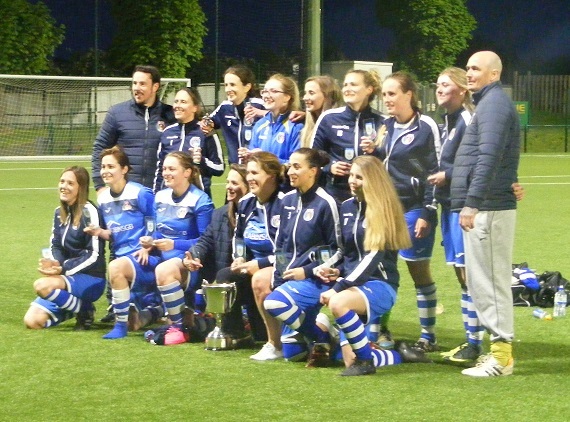 This entry was posted in Cambridgeshire Women's Junior Invitation Cup, Cup Final, Match Reports and tagged Cambridgeshire Women's Junior Invitation Cup, Cup Final, ICA Sports Ladies, Isleham United Ladies, Match Report on May 17, 2018 by WFEast. New leaders in the Cambridgeshire Women’s Premiership this weekend as Netherton United Ladies season long grip of top spot in the league is ended by St Ives Town Ladies moving into the leaders position for the 1st time in their short history. Started the day 6 points behind the leaders this Sunday saw them competing in a double header against bottom side Park Ladies. Two strong performances from St Ives Town seeing them take all 6 points available. 10 goals scored without reply in the two games. Amy Seymour-Shove and Frances Chapman getting a brace each with Tierney Coulson and Georgia Stancombe also on the scoresheet with goal a piece in the 1st game winning 6-0. 4-0 the winning scoreline in the other match with Coulson starting on the bench getting a brace, Chapman and Stancombe again getting a goal each too. Also in the Premiership 3rd placed Newmarket Town Ladies close the gap to Netherton United to 4 points with 2 games in hand after a big win at home to March Town United Ladies on Sunday morning. Sarah O-Rourke scoring a brace inside the opening 12 minutes to put Newmarket on the front foot. Abbi Griffin soon adding a 3rd goal. Chloe Slater also on target with a goal midway through the 1st half to see Newmarket into a 4-0 half-time lead. O’Rourke going on to complete her hat-trick in the 2nd half. Griffin also adding another goal with 20 minutes left to play. Newmarket going on to win the match 9-0 another player celebrating scoring a hat-trick, midfielder Laura Bailey a double as she was also celebrating her 17th birthday. The semi-finals of the Cambridgeshire Women’s Junior Invitation Cup this Sunday. In the all Premiership clash, ICA Sports Ladies were celebrating after they reached their 2nd final of the season. Away to Cambridge City Ladies Development this was a tough one to call both sides steadily improving as the season has gone on and in the end it was just a single goal that settled the tie. Jessica Farchina with the goal to send ICA Sports through to the final. In the other semi-final it was an all Cambridgeshire Championship South tie with Isleham United Ladies at home to Newmarket Town Ladies Reserves. Their 1st team taking on ICA Sports Ladies in this season’s League Cup Final Newmarket Town Reserves were looking to make it a repeat in the Junior Invitation Cup Final however Isleham had other idea’s as they were leading 2-1 after 20 minutes went on to take a 3-1 lead before Hollie Turner, Newmarket’s goal scorer in the 1st half added a 2nd from the penalty spot with 15 minutes left to make it 3-2 set up a tense finish Isleham holding out though to reach the final. Lily Turner scoring twice in the match with Rachael Turner also on the scoresheet for Isleham. 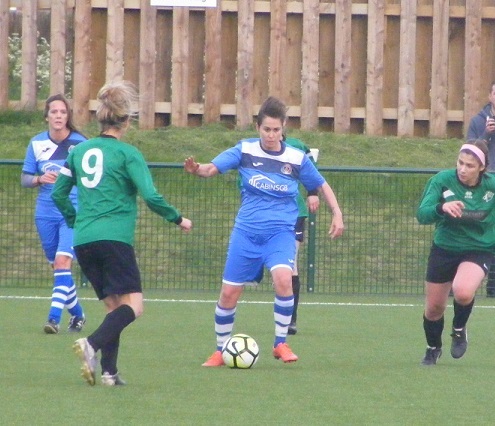 Two matches in Cambridgeshire Women’s Championship North this Sunday and it was a bad day at the office for 2nd placed Wisbech St Mary Ladies as they saw their unbeaten record end with a heavy loss at home to league leaders Ketton Ladies. An 8 point lead at the top for Ketton now as they scored 8 goals at the weekend, Sascha Smith amongst the goals scoring a hat-trick. Wisbech Town Ladies like most teams in the Championship North have games in hand on the league leaders however their pursuit suffered a blow at the weekend as they were narrowly beaten at home by Riverside Ladies, the Peterborough based side winning 5 from 5 now as they entered the league late. Wisbech Town suffering from absences and illness went 1-0 down in the match before turning it around to lead 2-1 at the break, Faye Kowalewsky and Josie Turner getting their goals. Riverside turning it around in the 2nd half as they were awarded two soft penalties Annie Posnett scoring both to see them lead 3-2. Added a 4th goal to open up a 2 goal lead Jess Hill and Samantha Woodham with their other goals. Turner pulling it back to 4-3 with 20 minutes left but despite pushing hard for an equaliser Riverside claimed all 3 points and move above Wisbech Town into 3rd position in the table. Two matches played in the Cambridgeshire Women’s Championship South also this Sunday. In a top of the table clash 2nd placed Histon Ladies Reserves were taking on leaders Fulbourn Institute Bluebirds aiming to close down the 3 point gap between the sides. Came up against a striker in red hot form this season as Marie Stubbings was on target for another hat-trick to take her onto 35 goals for the season. Fulbourn opening up a 6 point lead at the top of the Championship South table with a 3-1 win. Bottom side Burwell Tigers have had a difficult season on zero points at the bottom of the Championship South table were hosting 3rd placed St Ives Town Ladies Development on Sunday. 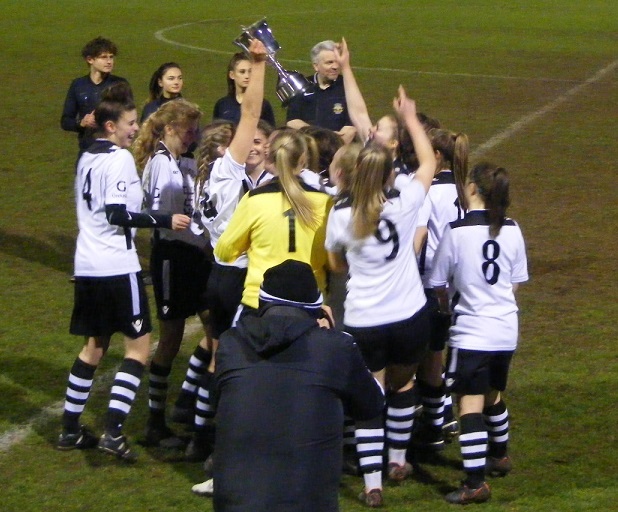 Had something to celebrate at last as they claimed a point in a 1-1 draw, Danielle Fletcher scoring the goal. Jess Guthurie scoring the goal for St Ives Town. In the Cambridgeshire Women’s Division One Cup there were two matches played in the group stage this Sunday both involving Championship North clubs. In Group C, Hungate Rovers Ladies claimed their 1st group win with a 2-0 home win over Orton Rangers Ladies. Whilst in Group D Spalding United Ladies drew 0-0 at home to Pinchbeck United Ladies both sides taking a point home from their final match. This entry was posted in Cambridgeshire Women's Championship North, Cambridgeshire Women's Championship South, Cambridgeshire Women's Division One Cup, Cambridgeshire Women's Junior Invitation Cup, Cambridgeshire Women's Premiership, The Round-Up and tagged Cambridgeshire Women's Championship North, Cambridgeshire Women's Championship South, Cambridgeshire Women's Division One Cup, Cambridgeshire Women's Junior Invitation Cup, Cambridgeshire Women's Premiership, The Round-Up on March 28, 2018 by WFEast. The Fulbourn Recreation Ground played host to the Cambridgeshire Women’s League Cup semi-finals this weekend. Newmarket Town Ladies were playing Cambridge University Women who had knocked out Premiership leaders Netherton United Ladies earlier in the competition. Newmarket Town started well taking an early lead in the match Abbi Griffin scoring in the 6th minute, further chances followed the lead doubled in the 26th minute Jordanne Sillitoe on target to make it 2-0, a 3rd goal quickly following Amanda Stacey heading home from a corner kick. A good first half for Newmarket another goal late in the half from Sillitoe putting them in complete control of the semi-final. Cambridge University pulled a goal back early in the 2nd half capitalising on a mistake at the back. 4-1 the score right up until the final minute of the match Chloe Slater making it 5-1 to see Newmarket into the League Cup Final. 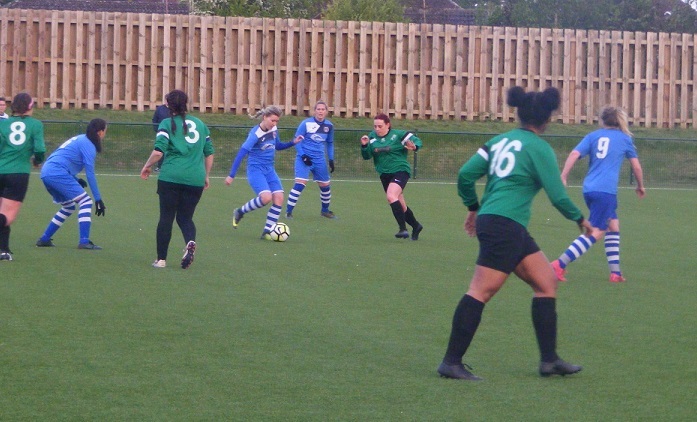 The other League Cup semi-final was again an all Premiership tie with ICA Sports Ladies taking on St Ives Town Ladies who would have started as slight favourites 2nd in the league with just one defeat. ICA Sports Ladies however have picked up some good results themselves this season and have improved well as the season has gone on. A closer tie a single goal enough to win the game coming in the second half. 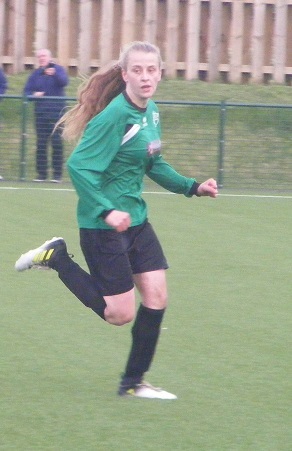 Lorna Hart the goalscorer as ICA Sports Ladies beat St Ives Town 1-0 to reach the League Cup Final. The League Cup Final between ICA Sports Ladies & Newmarket Town Ladies scheduled to be played on Wednesday 2nd May with a 7:30pm kick-off and Ely City FC. 3 games in the Cambridgeshire Women’s Premiership this Sunday with another double header taking place to ease fixture congestion. The local derby between March Town United Ladies and Park Ladies. 6 points up for grabs March Town took full advantage beating their local rivals twice 3-1 in both matches the 6 point haul enough to move them up a place in the table into 5th spot. 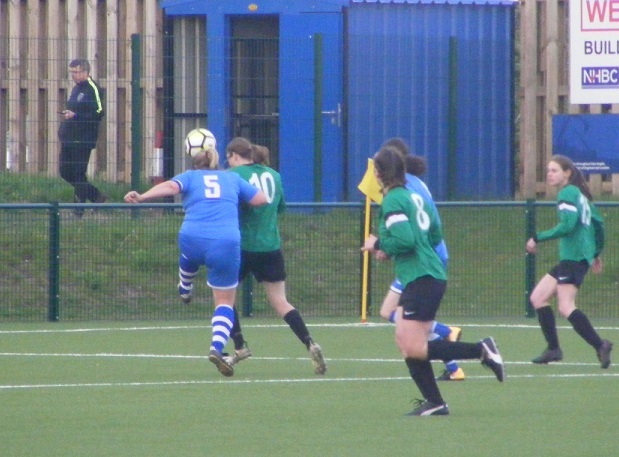 Charley Miller, Adele Munday and Shannon Shaw getting the goals in one of March Town’s 3-1 victories. Shaw on target again in the other match grabbing herself a brace with Ella Nutter also getting her name on the scoresheet. Cambridge City Ladies Development were involved in a double header with Park 3 weeks ago picking up all 6 points themselves this Sunday they were hosting the Premiership leaders, Netherton United Ladies. A brace from midfielder Rachel Pearce and with a goal each for Molly White and Yasmin Crow seeing Cambridge City earn the 3 points as they ran out 4-0 winners. A 3rd defeat of the season now for Netherton United Ladies after a great start to the season, encouraging for 2nd and 3rd placed St Ives Town Ladies and Newmarket Town Ladies who both have games in hand came both overhaul Netherton United if they win those matches. One outstanding quarter final left to play in the Cambridgeshire Women’s Junior Invitation Cup an all Championship South tie with Isleham United Ladies hosting Cambridge Rangers on Sunday. And it’s the hosts that progress to the last 4 of the competition with a 4-1 victory. A brace for Vicky Beeton along with goals for Louise Harwood and Nicole Bailey setting up a semi-final against fellow Championship South side, Newmarket Town Ladies Reserves. Two matches from the Group stage of the Cambridgeshire Women’s Division Cup this Sunday both in Group C. Wisbech Town Ladies going top of the 4 team table with their 2nd win in the competition, at home playing Hungate Rovers Ladies, goals from Faye Kowalewsky and Annie Rooks seeing them win the match 2-1. A positive result in their final match against Orton Rangers Ladies with ensure Wisbech Town top the group and advance to the knockout stage of the competition. Orton Rangers Ladies themselves were hosting Wisbech St Mary Ladies on Sunday in Group C the visitors having just 10 players available were held to a goalless score at half-time before going on to take control of the game in the 2nd half Amy Magnus getting herself a hat-trick, with a goal each for Ellena Bennington and Abi Roach-Smith in a 5-0 win. This entry was posted in Cambridgeshire Women's Division One Cup, Cambridgeshire Women's Junior Invitation Cup, Cambridgeshire Women's League Cup, Cambridgeshire Women's Premiership, The Round-Up and tagged Cambridgeshire Women's Division One Cup, Cambridgeshire Women's Junior Invitation Cup, Cambridgeshire Women's League Cup, Cambridgeshire Women's Premiership, The Round-Up on March 14, 2018 by WFEast. Two games from the Cambridgeshire Women’s Premiership this Sunday. Leaders Netherton United Ladies back in action after 2 weekends without a match were away to 2nd bottom Cambridge University Women. Having met them at the start of February winning at home convincingly 9-1. Away this time around Netherton United picked up all 3 points once again with top scorers Emily Johnson ad Yasmin Green netting a goal for the visitors in each half. Amanda Wainwright pulling a goal back for Cambridge University Women deep into stoppage time the 2-1 win sees Netherton United remain 6 points clear at the top of the Premiership. St Ives Town Ladies are their nearest rivals now as they moved above Newmarket Town Ladies into 2nd place in the Premiership on Sunday. Were taking on March Town United Ladies for the 5th time this season St Ives Town coming out on top in all the previous encounters in league and cup. Away to March Town this Sunday it was another convincing performance to record their 9th league win of the season. Leading the game 2-0 at half-time went on to score 4 more in the 2nd half to win 6-0. Six different goalscorers for St Ives Town too, Tierney Coulson, Hannah Seymour-Shove, Georgia Stancombe, Connie Liddiard, Megan Stow and Amy Seymour-Shove all on target. 3 games in hand on Netherton United with a 6 point gap to close the sides have to face each other twice yet in the league including the final day of the scheduled league season. One remaining quarter final to be played in the Cambridgeshire Women’s Invitation Cup this Sunday saw Premiership side Newmarket Town Ladies travelling to play Championship South leaders Fulbourn Institute Bluebirds. A narrow lead for Newmarket Town at half-time with a goal from Antonia Smith putting them in front. A brace from Jordanne Sillitoe sealing the win in the 2nd half to send Newmarket into the last four of the competition with a 3-0 victory. Both semi-finals scheduled to be played Sunday 18th March. Quarter final time in the Cambridgeshire Women’s Junior Invitation Cup too this Sunday with 3 of the 4 times taking place. Isleham United Ladies home match against Cambridge Rangers being called off. Their 1st team booking their place in the Invitation Cup, Newmarket Town Ladies Reserves followed suit in the Junior Invitation Cup knocking out Premiership competition along the way. Away to Park Ladies, Newmarket Town Ladies Reserves travelled with a depleted squad having just the 10 available but came away with the win. Park took the lead in the tie scoring in the 1st half. Hollie Turner levelling the scores for Newmarket before goals from Sarah o’Rourke and Molly Agnew saw them leading 3-1 at half-time. O’Rourke scoring again in the 2nd half to extend the advantage to 4-1, Park getting it back to 4-2 a goal for Joeli Kirby seeing Newmarket Town into the last 4 with a 5-2 win. Amy Newell and Charlotte Tweed scoring the goals for Park. 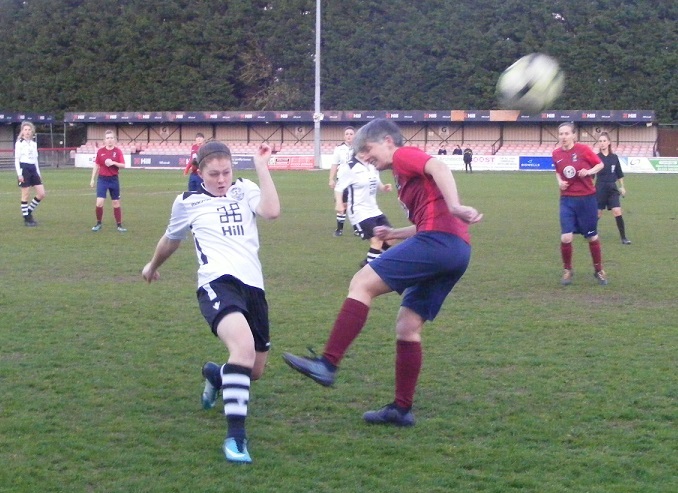 Premiership side ICA Sports Ladies were at home in the quarter finals of the Junior Invitation Cup meeting Championship South side Histon Ladies Reserves for the 2nd time this season in a cup competition. That tie went all the way to a penalty shootout before ICA Sports progressed. This time round it was 0-0 between the 2 sides at the break before a brace from Carmen Herridge in the 2nd half ensured the win putting ICA Sports through to the semi-finals. 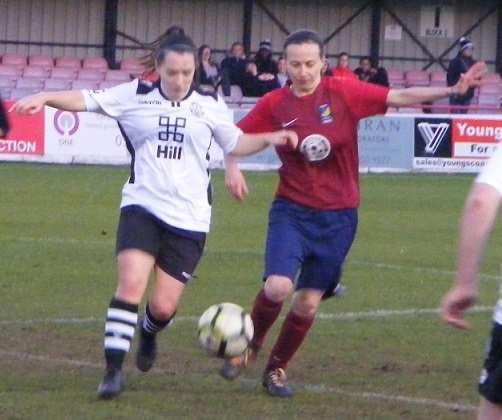 The final quarter final tie played this Sunday saw Championship North side Wisbech Town Ladies at home to Premiership side Cambridge City Ladies Development. The visitors taking the lead in the 10th minute Charlotte Gillies getting the goal. Wisbech Town came back to level the scores through top scorer Sophie Swinden. Megan Tonks returning to the side after a long term injury putting Cambridge City back into the lead on the half-hour. 2-1 the half-time lead Wisbech Town were far from out of the tie. Swinden getting it back to 2-2 in the 2nd half before Cambridge City went on to score twice more through Tonks getting her 2nd and a goal from Rachel Pearce. That the score going into the last 5 minutes sadly the game was abandoned at that point due to an injury to Wisbech Town’s Shushannah Feast suffering a double leg break a nasty injury which has since had surgery. Wishing Shushannah all the very best for a full and speedy recovery. Both semi-finals scheduled to be played Sunday 25th March. One match played in the group stages of the Cambridgeshire Women’s Division One Cup this Sunday a clean sweep of wins for Riverside Ladies in Group D as they won their 3rd match in the group away to Pinchbeck United Ladies. 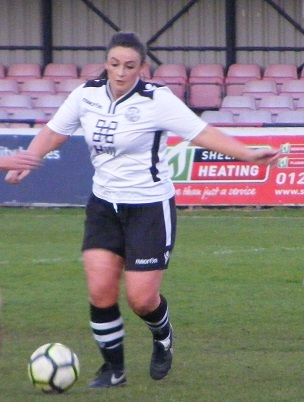 Samantha Woodham scoring a hat-trick. Both Annie Posnett and Sophie Harris getting a brace with Jess Hill, Diana Olahova and Saxon Clarke all getting a goal each in a 10-0 win. This entry was posted in Uncategorized and tagged Cambridgeshire Women's Division One Cup, Cambridgeshire Women's Invitation Cup, Cambridgeshire Women's Junior Invitation Cup, Cambridgeshire Women's Premiership, The Round-Up on February 28, 2018 by WFEast. Two matches played in the Cambridgeshire Women’s Invitation Cup on Sunday, Cambridge United WFC beginning the defence of their trophy away to Wisbech St Mary Ladies in the quarter finals. 4 leagues between the sides it was going to be a tough test for the side from the Championship North despite their impressive form this season. Cambridge starting the game well scoring at regular intervals progressed with a double figure win. Laura Baker and Faith Hewitt both scoring a hat-trick in the tie. Captain Laura Bright and midfielder Charlotte Crisp both getting a brace with a goal each for Carolyn Sarafian and Teonie Peyton for the FAWPL South East Division One side. 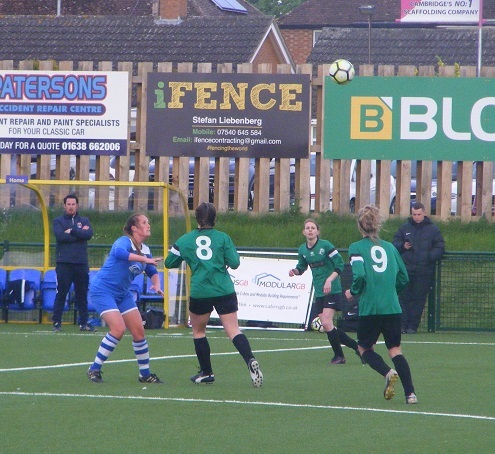 In the other quarter final played on Sunday it was an all ERWFL clash with Cambridge City Ladies 2nd in the Premier Division at home to Histon Ladies sitting in mid-table in Division One North. Cambridge City starting well taking the lead after just 17 seconds!. Histon coming close to levelling the scores Cambridge City finished the 1st half strongly scoring 3 goals in the closing minutes to have a 4-0 lead. Extended the advantage early in the 2nd half adding further goals on the hour and final 2 minutes to win comfortably in the end 7-0. Bella Simmons getting a hat-trick. There were goals too for Charlotte Gillies, Carla Penny and Bronte Rapley. Not every weekend you win 6 points but that is exactly what Cambridge City Ladies Development did as they played a double header at home to Park Ladies on Sunday as fixture congestion starts to bite. Ellie Cullum scoring 4 goals in the 1st game with Rachel Pearce also on target in a 5-1 win. Onto the 2nd game and it was a case of deja vu with the scoreline as Cambridge City ran out 5-1 winners once more. Cullum getting a brace this time around. Amy Ozakpinar, Erin Fox and Rachel Littlewood were also on target with a goal each in the match the 6 point haul putting them back up to 4th in the Premiership table. Also in the Premiership on Sunday it was a much welcomed home win for March Town United Ladies against Cambridge University Women on Sunday. Leading 2-0 at half-time, March Town United went on to win the game 4-1 to claim all 3 points their 3rd league win of the season. Shannon Shaw netting a brace with a goal each for Emma Searle and Adele Munday. Hannah Short scoring in the final 15 minutes for Cambridge University who remain 2nd bottom. Two matches played in the Cambridgeshire Women’s Championship North on Sunday leaders Ketton Ladies back in league action for the 1st time in a month opening up a 5 point lead at the top of the table once more with a win away to bottom side Orton Rangers Ladies. Fran Kavanagh getting herself a 5 goal haul in the match moving her onto 31 goals for the season. Sascha Smith also scoring a brace with Claire Lawrenson also on target for her 10th goal of the season in an 8-1 win. Riverside Ladies entering the league late made it 3 wins from 3 as they won away to Spalding United Ladies on Sunday the 5th place side’s goalscorers Roneta Mardosaite and Samantha Woodham with Dionne Lawton scoring from the penalty spot. The Cambridgeshire Women’s Invitation Cup also began this Sunday with 2 fixtures played, Championship South side St Ives Town Ladies Development at home to last season’s beaten finalists Wisbech Town Ladies. The visitors progressing with a 4-1 victory, Faye Kowalewsky scoring twice in the match their were goals too for Josie Turner and Sophie Gutteridge for Wisbech Town. Also progressing in the Junior Invitation Cup are Championship South side Isleham United Ladies at home on Sunday to fellow league side Burwell Tigers Ladies. Both Amy Ellis and Lily Turner scoring a brace, with a goal each too for Annabelle Marsh and Olivia Caffarelli in a 6-1 win. Vicky Murrell getting the goal for Burwell Tigers. This entry was posted in Cambridgeshire Women's Championship North, Cambridgeshire Women's Invitation Cup, Cambridgeshire Women's Junior Invitation Cup, Cambridgeshire Women's Premiership, The Round-Up and tagged Cambridgeshire Women's Championship North, Cambridgeshire Women's Invitation Cup, Cambridgeshire Women's Junior Invitation Cup, Cambridgeshire Women's Premiership, The Round-Up on February 21, 2018 by WFEast. Two cup finals in midweek covered by the Supporting Women’s Football Blog both in Cambridgeshire and both featuring Cambridge City Ladies and Cambridge United WFC. First up on Wednesday it was the sides Development and Reserves sides going head to head in the Cambridgeshire Women’s Junior Invitation Cup Final. The midweek football on the Supporting Women’s Football Blog comes from Cambridgeshire, two Cup Finals this evening and Thursday. The action this evening from the Cambridgeshire Women’s Junior Invitation Cup Final with new side Cambridge City Ladies Development in their 1st ever final taking on Cambridge United WFC Reserves the current holders of the trophy. Tomorrow the senior sides from both clubs meet in the Women’s Invitation Cup Final both competitions sponsored by S-Tech Insurance who have supported women’s and girls football in Cambridgeshire for 12 years now. A potential league and cup double on the cards for Cambridge City Ladies Development a new side formed this season have won the Cambridgeshire Women’s Championship South undefeated so far this season with a game left to play. With a strong and growing youth section the Development side a natural progression with players aiming for the 1st team that itself is enjoying a very successful 1st season at regional level. A 4th successive Junior Invitation Cup Final appearance for Cambridge United WFC Reserves having won the final on the previous 3 occasions. Are also through to the League Cup Final as they were last season and are aiming to win both trophies this time around. Challenging for the title in the Women’s Premiership too. Both sides were handed a Bye in the 1st round of the Junior Invitation Cup. Into the quarter finals, Cambridge City Ladies Development advanced without kicking a ball handed a walkover against Riverside Rovers Reserves. Cambridge United WFC Reserves beat Fulbourn Bluebirds from the Championship South 4-1 to reach the semi-finals. Cambridge City Ladies Development played fellow Championship South side Cambridge Rangers in the semi-finals winning the match 7-1 to reach their 1st ever Cup Final. Was a repeat of last seasons final in the other semi-final with Cambridge United WFC Reserves playing Championship North side Wisbech Town Ladies, won the game 3-1 to reach the final once again. The venue for this evenings final, Ely City FC has been a year since I last visited the ground, just off the A10 a new business development is taking shape in the former entrance to the multi-sports facility housing not only the football club, but also rugby, squash and golfing facilities. Several food outlets as well as a cinema are proposed for the sight a new road leading to the football club already built. A dry start to April the pitch looked hard bobbly in places. A few dark clouds around with a brief shower before the match the temperature starting to drop as the floodlights took effect. Cambridge City Ladies Development starting XI – Josie Cambridge, Lucy Hurst, Tegan Wyman, Gemma Clare (C), Amy Ozakpinar, Rachel Pearce, Erin Fox, Grace Stanley, Ellie Geoghan, Megan Tonks & Anna Wilson. Cambridge United WFC Reserves starting XI – Sarah Carroll, Emily Ingle (C), Holly Northfield, Liz Pamplin, Carolyn Sarafian, Tahnee Perfect, Gabrielle Whitehurst, Lucy Gateson, Teonie Peyton, Ebony Rule & Lauren Gibson. Two Cambridge’s playing it’s a challenge writing notes and to make thing’s easier for those reading the report too I’ll refer to the sides as City and United from now on. It’s United to get the final underway kicking off 1st half wearing amber shirts and socks with black shorts, City opposite wearing white shirts with black across the shoulders, black shorts and black and white hooped socks. United press early the ball won by Gabrielle Whitehurst in midfield played out to Teonie Payton making a run down the right wing taking the ball down the line wins a corner kick, the ball is delivered towards the top of the area City’s Rachel Pearce to it first sends the ball up field. An open start both sides looking to use the full width of the pitch, from a throw on the right inside the City half striker Lauren Gibson looks to drive inside towards the box, is tackled by Tegan Wyman at left back the ball played on City counter Ellie Geoghan up the left is stopped by United’s captain Emily Ingle the a ball rolled into midfield helped on as Gibson looks to get in behind the City defence, goalkeeper Josie Cambridge is out quickly to reach the ball first. Gibson is played through as she comes across to the right to receive the ball unleashing a low shot from just inside the box, Cambridge behind it makes the save. United are beginning to see a little more of the ball keeping City out of their area the defence winning any through balls, bringing the ball down the right Peyton’s long crossfield ball is gathered by Lucy Gateson looks to take it down the line, tackled by City’s Lucy Hurst the ball out for a throw in taken quickly United win their first corner of the match the delivery in towards the top of he area, up from the back Liz Pamplin gets a glancing header on the ball knocking it down into the six yard box, City win the scramble to launch it clear. City are left perplexed as they break forwards the ball from Pearce into attacker Megan Tonks 20 yards out is brought down by United’s Carolyn Sarafian with Geoghan in behind on the overlap stealing in on the ball the referee plays advantage it comes to nothing and City feels play should have been brought back for the free-kick. City build another attack the ball from left to right across midfield Grace Stanley running into space on the right takes the ball on into the box, United’s Holly Northfield gets back on her the pair tussle for the ball inside the box right corner, Stanley rolling the ball around the full back to get in behind is adjudged to have fouled Northfield. Gibson closes the ball down on the right from a throw in getting hold of the ball travels into the area hitting the shot on the run, plenty of pace on the ball, goalkeeper Cambridge saves instinctively with her feet. Keeping possession in the final 3rd United eventually win a corner kick. High into the middle of the area, Stanley heads the ball out of the area for City, falls to Peyton outside the box closed down quickly gets a snapshot away the ball flying wide of the near post. Bringing the ball on through the centre of midfield Stanley threads a great pass into Tonks up top in behind takes the ball on into the area, looking to shift the ball onto her favoured foot to take a strike, gives Northfield the opportunity to nip in to get her toes on the ball nullify the threat for United. GOAL! The opening goal of the Final comes midway through the 1st half, United pile players forwards as they attack with purpose with Gibson having come over to the right side the ball down to the touchline is cut back in towards strike partner Ebony Rule unmarked inside the box opens her body up taking the shot looking to put the ball across he goalkeeper, Cambridge gets a glove on the ball but pushing it away into the centre of the six yard box, Payton is quickest to react reaching the ball and smashing it home to give United the lead 0-1. Peyton winning the ball at the back for United sees her deflected clearance fly over the top with Gibson alert after it running clear of the City defence, heading for the box, Cambridge is out quickly sliding in to stop the ball getting beyond her. City make a change, Amy Ozakpinar coming off at the back, Anelia Luxford coming on. Soon after Erin Walusimbi comes on for City in place of Erin Fox. Pearce rolls the ball on into striker Anna Wilson pressuring the United defence she squeezes the ball into Tonks to her right shooting from outside the area her strike is blocked the deflection coming to Walusimbi on the right pushes on into the box her cross turned behind for a corner. A good delivery in towards the penalty spot it’s United’s Pamplin who wins the header. Geoghan comes off for City, Rachel Littlewood coming on. Gateson bringing the ball on down the right flashes a cross along the face of the City area comes all the way through to Peyton who takes on the shot from distance, Cambridge is right behind it to hold comfortably. United very nearly double their lead a long ball played on through the middle, Gibson closes City captain Gemma Clare down as she looks to control, tries to head the ball back to her advancing keeper Cambridge gets too close Clare under pressure knocks the ball past her the ball heading towards goal the City defence win the race to clear the ball off the line. A corner on the left conceded City are down to 10 as Walusimbi is sent to the dugout to deal with a plaster on her nose. Kayleigh Whitehead being readied for a substitution comes on even as United take the corner, Clare dealing with the ball inside the box played out for a throw in. GOAL! Moving into the last 5 minutes of the 1st half United double their advantage, Gibson having been a constant outlet for the ball in the game receives the ball played across from the left as United come forwards knocking it down into space in field, Whitehurst runs clear striking the ball from 25 yards out her shot whistling past the keeper into the back of the net 0-2. The City bench aren’t happy the referee stops play to have a word. Walusimbi returns to the action replacing Hurst late on. City are very nearly undone for a 3rd goal as the defence looks to shield the ball played on by United as it trickles towards the edge of the box for Cambridge to pick up has her gloves on the ball just as Rule nips past the defence to take it from her, clear on goal play however is brought back by the officials. A strong end to the 1st half from United breaking down the right the ball squared in towards Gibson outside the D hits the shot on the turn as the ball comes into her the strike looping up over the crossbar. Tahnee Perfect breaks with the ball through the middle rolling it on for Gibson peeling off the shoulder of the last defender shoots from the top of the box the ball sent wide of the near post. A good 1st half from United having the bulk of the attack, getting the ball forwards Gibson a threat through the middle, Peyton too on the wing firing herself up with a bit of banter with the crowd. Up the other end their defence as snubbed out any threat winning the final ball little for goalkeeper Sarah Carroll to deal with. 2-0 always an interesting score United good for it as is often the case the next goal will be crucial. It’s City to get the 2nd half underway looking for a positive start. Littlewood with a run on the ball into the left channel her cross into the area cleared by Sarafian. A diagonal ball played long up into the United area is headed clear falling to Pearce outside the area, won’t sit kindly as she looks to bring it under control adjust for a shot, is closed down the chance gone. Gibson goes after a heavy through ball running out to the left gathering on the line, Cambridge has come out to the edge of her box that side seeing the striker will reach the ball before it runs out of play, the angle is against Gibson as she tries to put the ball wide of the keeper runs wide behind the goal beyond. City have started the 2nd half well more energy getting extra bodies forwards to put pressure on the ball. Pearce plays the ball on through the centre for Tonks, closed down outside the box as she goes to strike the ball spins across to Littlewood on the left plays the ball back across the top of the area, Perfect wins the header knocking the ball outside the box comes at Wyman quickly tries to connect with the ball 1st time slices her effort away from goal. Up top for United, Gibson and Rule combine well both pressuring the ball Gibson almost playing Rule in behind, Clare with the tackle to stop her running clear. Awarded a free-kick wide right City send the ball up into the area, again it’s Perfect who wins the header clearing for United. GOAL! Cit’s positive start to the 2nd half is undone as United extend their lead in the 5th minute. breaking up at attack through the middle from City the ball from defence is played long up into Rule 30 yards out back to goal controls well his close support from Gibson to her left rolls the ball into her Gibson’s first touch gives her a yard on her marker as they race for the area, Cambridge coming out to meet her Gibson knocks the ball to the right taking her by the keeper clear to shoot putting the ball home off the inside of the post from 10 yards 0-3. City attack from the restart the ball into Stanley moving left drives into the box looks to fire the ball across goal deflected off a defender the ball comes into Wilson at pace can’t adjust to turn it towards goal. Wyman plays the ball on for Littlewood to attack on the left side squares the ball along the top of the area looking to pick out Wilson, Whitehurst gets back to tackle the striker before see can line up a shot. A throw for United on the right Gibson helping the ball in as Rule makes the run in behind takes the ball on into the area, Walusimbi trying to get across lunges in a wild attempt to win the ball, Rule caught could have gone to ground, doesn’t keeping control of the all sends her shot across the keeper, the ball striking the base of the far post, still in play cleared for a throw on the opposite side a long ball is swept in towards the near post, Cambridge coming towards it makes the claim. A knock for United’s Ingle as they defend a City corner comes off to be replaced by Claire Kilmartin. A good tackle from City’s Wyman as Gibson brings the ball under control and looks to spin in behind off the full back to get into the box. Peyton brings the ball inside as she attacks down the right side rolled into Gibson her touch helps the ball on with Rule stealing in behind the City defence into the box puts her strike wide of goal. Another change for United with Payton giving way for Kirsten Burt. GOAL! 25 minutes played in the 2nd half and United go further in front. Possession on the left from a throw in inside the City half Gateson and Gibson link up the ball played long in towards the far post Rule times her run perfectly arriving to head the ball in at the near post inside the six yard box 0-4. Tonks sees a shot from 20 yards charged down the ball deflecting wide to the left Littlewood winning a corner kick the ball flashes in through bodies gathered at the near post a snap shot far side swoops up over the bar. Ingle returns to the action replacing Sarafian at the back for United. Fox comes back on for City in place of Wyman. McKenzie McGregor also on for United Gateson the player off. A high ball played in from the left is chested down by McGregor as she comes across the D left to right knocking it on into the area, shoots wide as she is closed down. More changes late on Ozakpinar back on for Clare for City, Ellen Green replacing Pamplin. Fox skips past two players in the middle sending the ball through for Tonks, Ingle gets across her run shields the ball back into the keepers gloves as the game moves into the last couple of minutes. GOAL! Pushing forwards looking to find themselves a goal late in the game City are hit on the counter the ball won back and sent up field by Perfect into Rule in space 25 yards out turns and sends her shot in up over the goalkeeper to score her 2nd of the game 0-5. GOAL! Another goal soon follows as Gibson capitalises on some hesitant play at the back from City the ball closed by Gibson as the keeper starts to come between goalkeeper and defender Gibson closes down the ball knocking it wide of both into space inside the box and sends the ball into the goal beyond to score her 2nd of the game 0-6. It’s Cambridge United WFC Reserves who celebrate at the final whistle winning comfortably 6-0 with a good all round team performance that gave their opponents little opportunity to make an impact in the final 3rd. A harsh scoreline for Cambridge City Ladies Development conceding 2 late goals as they became a little ragged looking for something up the other end. Cup Final runners-up and league Champions is a fantastic achievement for a side in it’s first season. A good all round team performance from Cambridge United WFC Reserves the SWF Blog – Player of the Match goes to striker Lauren Gibson, scoring 2 goals was a constant threat and outlet up front working the space in the channels well keeping the opposition defenders from bringing the ball out. Congratulations to Cambridge United WFC Reserves on another Junior Invitation Cup success. My thanks to Cambridgeshire FA’s Chris Abbott for his help tonight. A quick turnaround for all do it again tomorrow night. 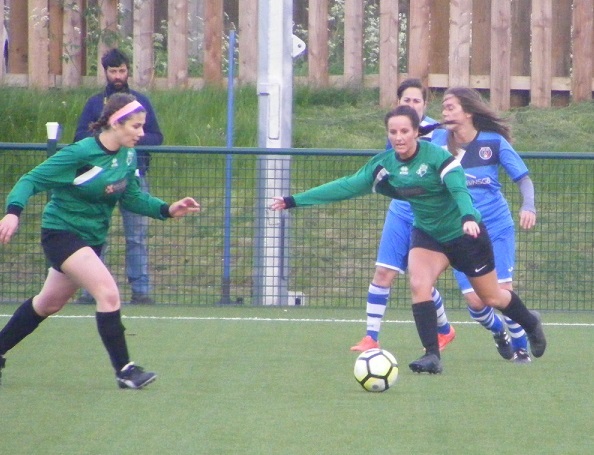 This entry was posted in Cambridgeshire Women's Junior Invitation Cup, Match Reports, SWF Blog and tagged Cambridge City Ladies Development, Cambridge United WFC, Cambridgeshire Women's Junior Invitation Cup, Match Report on April 13, 2017 by WFEast.